John A. Belcher graduated Phi Beta Kappa from the University of California at Berkeley in 1978 with a 3.9 Grade Point Average. Recipient of the Alexander Meicklejohn Award and the Medaille Voltaire, Mr. Belcher attended Boalt Hall, where he was selected to serve as an Extern Clerk to the Honorable Cecile Poole of the United States Court of Appeal for the Ninth Circuit. While enrolled at Boalt, Mr. Belcher served under Stanley Sporkin in the S.E.C. Division of Enforcement, Summer Honors Program as a Charter Selectee. Following graduation from Boalt Hall in 1981, Mr. Belcher was employed as a Deputy District Attorney by the Contra Costa County District Attorney’s Office. Mr. Belcher was appointed to the felony trial team in Martinez, California, where he served with distinction prosecuting complex felony jury trials, including three “double jury trial days” with jury trials proceeding back to back. 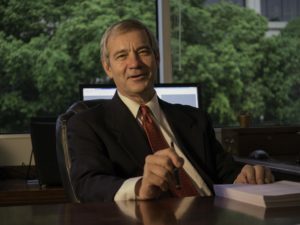 As a civil litigator in Los Angeles for over thirty years, Mr. Belcher has litigated as “first chair” over one hundred arbitrations, court trials and jury trials from the Mexican border to Santa Barbara County. B.A. Economics, 1978 with Great Distinction, 3.9 G.P.A.